In 1997, a group of music-loving craftsmen from Memphis, TN rocked the audio world with the debut of the ANDRA. EgglestonWorks was not well-known at the time but Andra changed that very quickly. Less than a year after its introduction, Andra had appeared on the cover of Stereophile Magazine – not once, but twice in 3 months – earning that publication’s prestigious “Speaker of the Year” award. Praise for Andra came from audiophiles and audio professionals alike. Legendary mastering engineer Bob Ludwig was an early adopter, purchasing 5 Andras to outfit his DVD mastering setup. Ludwig chose Andra for its clarity and truthful character coupled with a non-fatiguing sound that made hours of work seem like minutes. During its remarkable lifespan, the Andra has seen two major design updates as well as numerous small detail improvements. Both the Andra II and III versions have remained faithful to the standards of excellence established by the original, while at the same time advancing performance, aesthetics and build quality. How do you celebrate a product whose 20 years of excellence has defined our company? We at EgglestonWorks, felt that such an important milestone deserved to be honored by a completely new product born of the Andra tradition. Offered as a Limited Edition, the Viginti was developed to pay homage to the Andra and build upon its legacy. 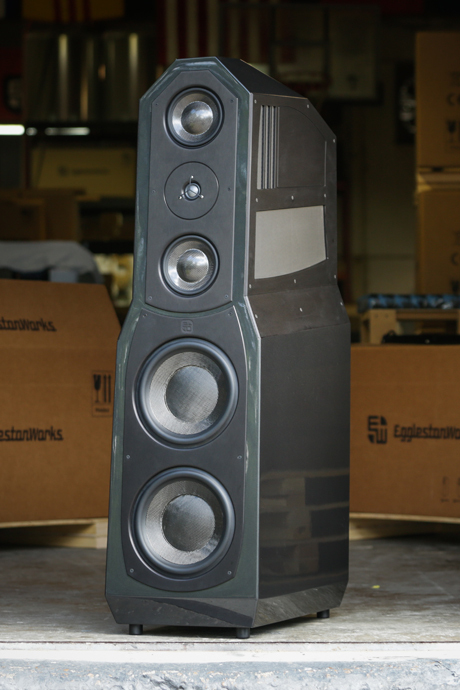 Viginti–Latin for “Twenty”– is the culmination of EgglestonWorks’ 20 years of audio excellence and defines the State-of-the-Art in speaker design. Featuring a bass enclosure incorporating dual 10” carbon woofers and a unique slot porting system, there is no lack of authoritative, effortless and pitch-perfect bass. Our proven 6” carbon-dome midrange drivers endow Viginti with the unsurpassed mid-range clarity for which Andra is renowned. A cutting-edge Beryillium tweeter delivers extended and detailed trebles with the fatigue-free musicality which is the hallmark of EgglestonWorks designs. Handcrafted in our custom cabinetry division, Viginti’s evolutionary silhouette hides a myriad of meticulously formed and critically placed internal braces, while extravagant use of aluminum and carbon fiber compliment the speaker’s stunning paintwork. The result? Viginti isn’t only one of the most sonically satisfying speakers available: it’s one of the most aesthetically pleasing, as well! Heritage and innovation. Tradition and transformation. Several years of careful development ensure that The Andra Viginti Limited Edition honors its past and defines the future. Spending a little time with Viginti will illustrate why this remarkable product advances the Andra legacy.